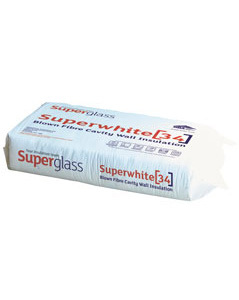 Superglass Superwhite 40 is designed specifically to provide thermal insulation for retro-fit/existing masonry cavity walls with a minimum cavity width of 50mm and up to 12m in height. It may be installed in buildings of 12m – 25m in height subject to a satisfactory inspection of the wall construction and installation approval by Superglass Insulation. 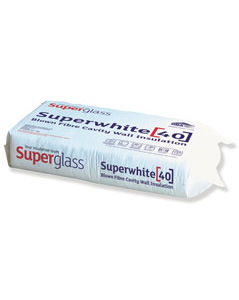 Superglass Superwhite 40 is installed quickly and easily, using existing machinery by a nationwide network of Superglass and BBA approved installers. – Thermal conductivity of 0.040W/mK when tested to Lambda 90/90. – Installed after the walls are built by approved installers. For an installed density of 18kg/m³ the following coverage should be obtained per bale. Thermal conductivity of 0.040W/mK when tested to BS EN 14064- 1: 2010 (Lambda 90/90). Tests by the BBA confirm that Superwhite 40 will not transmit water to the inner leaf. Please refer to the BBA certificate for more information. Has a 25 year guarantee and is inspected under the BBA Surveillance Scheme for cavity wall insulation.